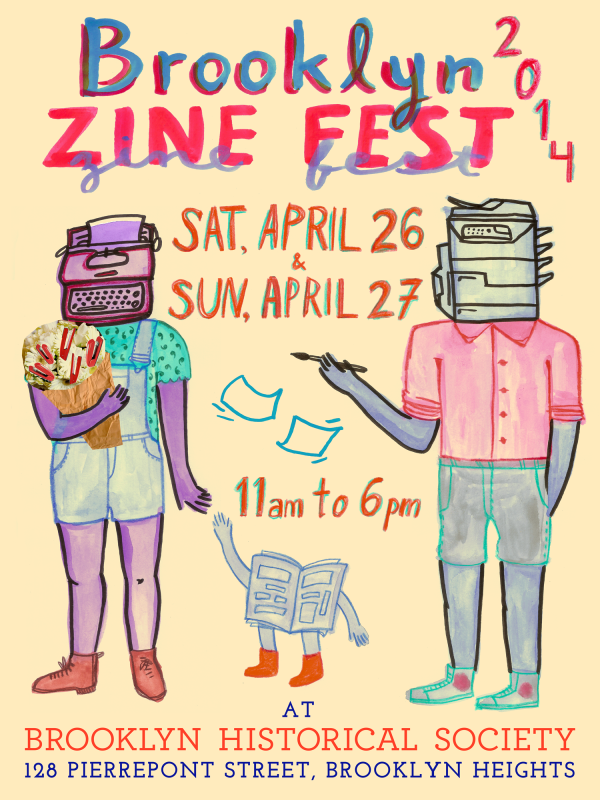 Pegacorn Press will be tabling the Brooklyn Zine Fest, this Sunday, April 27th. Stop by, say hi and get a copy of the new exhibition publication for my solo show (more info below), Garden of the Womanimal. The Booklyn Art Gallery is pleased to present GARDEN OF THE WOMANIMAL, an installation by Caroline Paquita and a small survey of thirteen years of drawings, paintings, prints, sculptures and zines. GARDEN OF THE WOMANIMAL explores a recurring theme throughout the recent years of Caroline's work, depicted in a wide variety of media, a cult of "womanimals" half-women/half-wild animals are illustrated in landscapes of playful sexual scenarios, mystical adventures, and explorations of nature and the body. The womanimals' corrupt playfulness and exuberance are contrasted by the meticulously clean line work of Paquita's drawings and paintings. Newer works are surrounded by thirteen years of imagery demonstrating the evolution towards this theme and its stylized representation. Culling works from her personal collection GARDEN OF THE WOMANIMAL creates an audacious yet welcoming environment of new and past works including drawings, paintings, screenprints, paper mache, sewn soft sculpture, kinetic wood sculpture, Risograph prints and zines. The installation is climaxed by Paquita's new artist book, published exclusively for the exhibition, compiling years of screenprints, Risograph publishing ephemera, and drawing reproductions into a beautifully hand-bound hardcover limited edition. GARDEN OF THE WOMANIMAL is Caroline Paquita's first solo exhibition in New York. Born in Miami in 1980, Caroline studied creative photography and art history at the University of Florida in Gainesville. In addition to her personal art practice, Caroline is a musician and an independent publisher working under the guise Pegacorn Press. Printing exclusively with Risograph since 2009, she has collaborated with and published work by Al Burian, Anna Haifisch, Brontez Purnell, Mike Taylor, Sy Wagon, and Lale Westvind. Coinciding with the exhibition, Caroline and Booklyn are collaborating on compiling and archiving sixteen years of her self-published zines to be released as a limited edition box-set in May 2014. This exhibition is made possible in part by the New York State Council on the Arts with the support of Governor Andrew Cuomo and the New York State Legislature and additionally in part, by public funds from the New York City Department of Cultural Affairs, in partnership with the City Council.